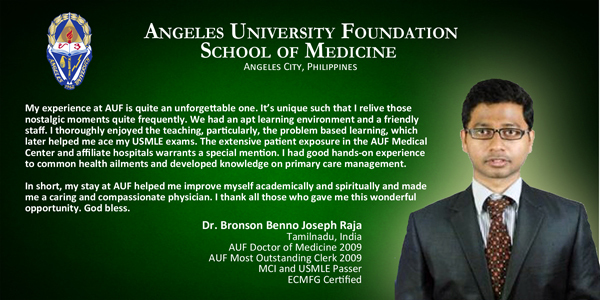 "I can't just simply express how happy I am because I made the decision to study here in AUF. On July 4, 2005, we started our four-month-long ESL program, and had a taste of the AUF way of learning English through authentic activities and tests. We had lecture presentations to showcase our culture; our class staged a Filipino-Korean Friendship Talk which presented our insights to some issues affecting our society. I won't forget also the interview, surveys, news casting activities, and listening assignments that we had to accomplish. These tasks have become meaningful learning opportunities to cherish." 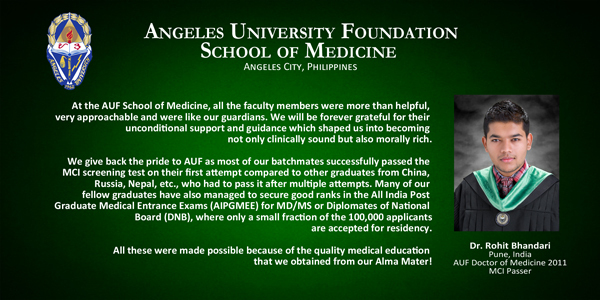 "In our place here in the province of Tarlac, I heard AUF is an excellent institution when it comes to medical and nursing professions producing topnotchers and globally competitive individuals. 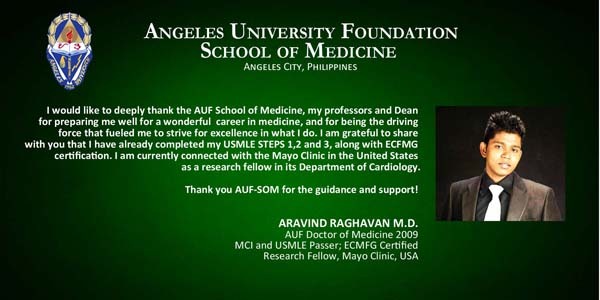 I enrolled as a BS Nursing student and AUF presented me with a lavish gift - I was granted a Barbara Yap Angeles (BYA) scholarship owing to my academic status in high school. I will forever be thankful for that. Then in my sophomore year, thru hard work and prayers, I gained a College Scholarship which I treasure and carefully maintained up until now." 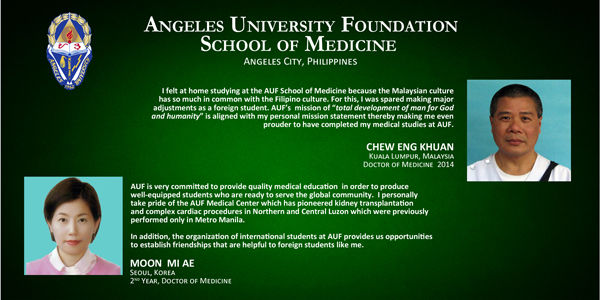 "Me and my three other siblings picked AUF because we were told that the nursing school is very promising with regards to its curriculum, and that the degree was accredited in the states. Also the location was not as much of a culture shock as compared to manila. 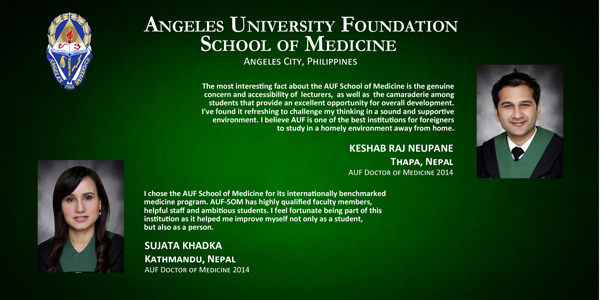 My pleasant experiences at AUF are when I'm active in the school, from a variety of different competitions, to leadership positions and representation of my very own college of nursing. All these exposures help me learn much that I can apply in life, and I gained a wide network of interactive connection from so many interesting people of all gender, age and nationality." 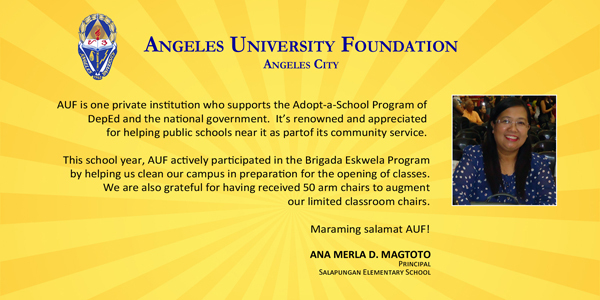 "I chose Angeles University Foundation as my school for the start of my college life because of the quality of education they are offering to students like me. I never regret being a part of the university because there is no discrimination among students and the staff or the college is so accommodating when it comes with our needs. One thing I like in the college is that when it comes with academic problems or personal problems they have an open heart to help and understand the students, and they make sure that they know their students like our guidance counselor, level coordinator and clinical instructors."